The Big & Tall Men's Taclite Pro Pants from 5.11 Tactical deliver long lasting durability and all-day comfort in a professional package. 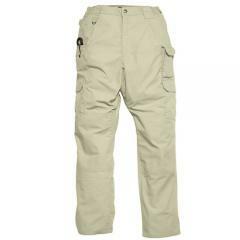 Fabricated from a tough poly/cotton ripstop textile, these pants offer the rugged protection demanded by law enforcement and tactical professionals. The pants resilient exterior protects the wearer from cuts, scratches and other injuries while also insuring extended service life. No more wasting money buying new duty pants every time the job gets rough. Billowed cargo pockets feature external pouches for convenient access to cellphones, magazines and other equipment. A strategic knife pocket on the right sides ensures essential gear is never far from reach. Great product. 5.11 is the best.